On April 18th, 2012 Tempur-Pedic International Inc. (TPX) traded at a high of $87.43 and in June, their stock took a nosedive to its low of $20.00 and some change. What happened? One thing we know for sure, if you are identified by Wall Street as a growth stock and you stop growing, it’s a big step off of a very large cliff. Also, I have heard some analysts criticize the way Tempur-Pedic has been communicating with investors and that this is part of their problem. I am sure there are more theories, but setting all of that aside I want to talk about the fundamentals and why I think they are experiencing some trouble. There was a decision to start paying more co-op money to retailers and share in some of the good fortune. Many retailers out there liked this direction, even though, given the amount of co-op Tempur offered, it was considered by some to be a token move. But hey, Tempur seems to know how to spend their money to drive traffic so who can really fault them for wanting to control the purse strings? The point here is that, for Tempur-Pedic, it was a major change in how they approached their business and it moves them away from a model that was working. In the past Tempur never discounted products, but recently announced rollbacks for Memorial Day. If you are driving so much business that you don’t have to play pricing games you have really accomplished something. So what does this move say to retailers and investors? Consider other consumer product brands like Coach or Prada for instance that also utilize the MMAP pricing policy—what if they were to start running their handbags or clothing at 20% off? What would it do to their image and perceived value? Staying on the price issue for a minute longer, Tempur-Pedic always stayed above the fray in their niche of upper end bedding. Hell, in many ways they created this segment and brought a lot of their competitors along for the ride. So what does it say when you go down market with a product that is plugged-in to an existing line and reviewed by many as weak and uncompetitive? Did they ever intend to sell it, or did they simply want to create a bridge for consumers to sell more of their other products? Debate these three things as good or bad however you want, it doesn’t really matter because the point I am trying to make is that they made BIG BETS in all cases. One of the things Garold Swaim, our head of product testing at the Idea Center has taught me, is that if you are trying to figure out how to make something perform better, make one small change at a time and re-test. If you change two to three variables all at once, you will never know what made the difference. Tempur-Pedic is changing at least two to three variables all at once. These shifts are fundamental changes to how they operate—not tweaks to the management team, or a new lean manufacturing initiative. I am talking about monster moves here that really create a new paradigm. In some ways, are they becoming like all of the other bedding companies out there? Does this create opportunity for the competition? It’s very possible. Did Tempur-Pedic get big eyes when making their sales projections for 2012? At some point was there a realization that they could not get there with business as usual, therefore they are scrambling to force the issue? Only they know. One thing I know is that this is a good company with some good people that, like the rest of us, are navigating some rough waters. So what do you think—is Tempur-Pedic on the right track? Should they stay the course or shift back to their old way of doing business? Tell me in the comments section below. In a recent conversation at the Anti-Defamation League dinner with Tempur-Pedic’s Rick Anderson, he reminded me that in the past year other bedding manufacturers have launched more products targeting Tempur-Pedic and the specialty category than ever before, creating a very competitive landscape—and he’s got a great point. Wrong move on Tempur’s part. As a Tempur retailer for years I think that the new “promotional” line is a step in the wrong direction. Either they are greedy or scared (or both). Let the “wanna be’s” fight over the scraps. They may be a marketing giant but they do make mistakes. Why they keep bring back the “Buy two pillows and get one free” I’ll never know. Tempurpedic is looking a little haggard and even a bit desperate these days. All that they can do to respond to the iComfort product (that is eating their lunch) is to whip out a hair dryer and say the Serta’s product is hotter tempurature-wise than their’s; and also say to dealers that iComfort is “trading down” gross margin dollars. First of all, the hair dryer presentation is very “bush league” if you ask me, and not one that I would expect from the market leader. Secondly, I guess that they don’t consider their own Simplicity line “trading down” dollars; only if lower pricing comes from a competitor. If having more competitive pricing on an innovative product is trading down, then they better get used to it. They can rest on their laurels for only so long. I say that the way that they are responding to competitive pressures is as much a sign that they are becoming mediocre as anything metioned in this blog. She bought the Tempurpedic from me. 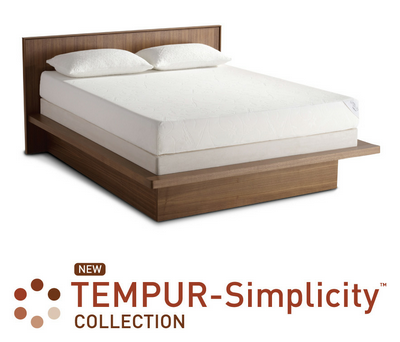 Tempur’s products are still very good and their marketing direct to consumers is unmatched in the mattress business. The co-op is a non-story. Rolling back the Cloud Supremes is not a big deal, they rolled them back to the same prices they sold them at for the past two years before their price increase. The Simplicitys are a good idea to increase the number of prospective consumers that can become Tempurpedic customers. Tempurpedic’s problem is that while they can allow their very weak competition (the 3 Stooges: Sealy, Serta and Simmons) to keep chipping away at their market by converting innerspring slots to specialty, Tempurpedic can’t do anything to go after their share of customers. But imagine of Tempurpedic made innerspring mattresses? The fragile “S” Brands would all be in huge trouble, as they can’t do anything to match Tempurpedic’s brand recognition dominance. Then you take into account the Barron’s article . . .